One of the most essential ways to keep a clean home and have good indoor air quality is to use good air filters in your furnace and air conditioning systems. Often forgotten, an air filter is the front line of defense in capturing dust, pollen, fur and other allergens in your environment. However, filters can seem confusing until you understand what kind you need and how often do you need to change it. Air filters are used to keep dust, dirt and other particles from entering the ducts leading to your heating and air conditioning. They trap items to keep them from blowing through your ventilation systems. The most common air filters used in home air conditioning or heating systems are disposable filters in cardboard or wired frames, made to pop into the openings of intake vents. It is usually as easy as using a screwdriver or flipping a latch, removing the cover and old filter and setting in the old one. While fiberglass disposable filters are quite inexpensive, they only trap large particles and should be changed monthly. Other disposable filters are designed to trap tiny particles and should be changed every three months. Permanent filters must be removed from their casing and washed periodically. While they reduce waste, they take more time and effort to maintain, often needing to be cleaned every month or two. Some of these shields use electrostatic material to help capture airborne particles, but the charge can diminish over time. Disposable filters are the most popular, for both their convenience and flexibility. Of course, the first thing to consider when buying replacement disposable home filters is size - filters come in an array of sizes. Some homes may even have different sized filters in different vent locations. Always write down the filter size you need, since they look surprisingly similar. Filters are measured in height, width and depth, so make sure you note all three dimensions for the proper fit. The next thing to consider with filters is their materials, what they capture, and how clean they get the air. It is important not to shop by price alone as many filters are ineffective on very small particles, and others only last for thirty days. 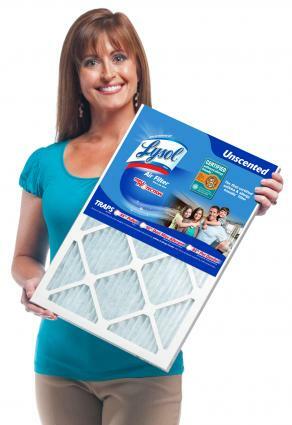 Two of the top-rated products for really effective home filtering are new offerings from Lysol and 3M's Filtrete line. 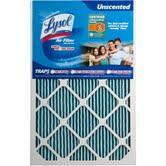 Lysol is a name many people associate with clean, and now this brand has a line of home air filters. Manufactured by Quality Filters, Inc., the Lysol filters are the first product to be certified as allergy and asthma friendly by The Asthma and Allergy Foundation of America. Rigorous testing was done to standards set by the American Society of Heating, Refrigerating and Air Conditioning Engineers as well. Jim Gates, Brand Manager at Quality Filters told us about the extensive testing and efficacy of their new Lysol filter, "Lysol Air Filter Triple Protection has been thoroughly tested and certified to be asthma & allergy friendly. It will not cure asthma or allergies, but will reduce things that trigger attacks. I am aware of no better filter on the market." Want to try this new product? They are available throughout the Midwest at Menard's home improvement stores. Another home filter product geared toward allergy sufferers is the Filtrete line from 3M. Their Micro and Ultra Allergen lines dramatically reduce counts of microscopic pollen, dander and other allergen particles in the environment. 3M also makes products that only work on dust or large particles, so read the labels carefully and purchase the Ultra line if you want the highest level of filtration possible. The 3M products are widely available at home improvement and hardware stores. Whatever type of filter you choose, make sure to change or clean them as often as the manufacturer recommends. In addition, use a vacuum to clean the grates protecting the filters when you change them so you are starting fresh. Not only is a dirty filter less efficient for cleaning the air, but having an efficient air flow through the duct intakes keeps heating and air conditioning units more energy efficient. Note: Quality Filters provided the author with sample Lysol Air Filters for review for this article.